The Absolute Zero Degrees Net and Ball wallpaper might be familiar design – but it’s fame actually comes from the floor rather than the wall. It uses the design of the original 1951 carpet from the Royal Festival Hall, the work of original architects Peter Moro and Leslie Martin and apparently the visual representation of sound – with the addition of the ball purely for effect. 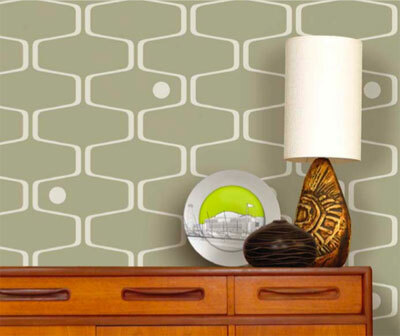 The wallpaper has been commissioned by the Southbank Centre and is only available to buy from the Southbank Centre Shops from April 2008 in the olive and grey colourway pictured. It retails for £50 per roll.